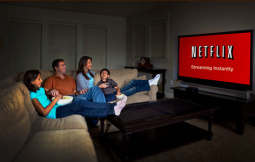 Netflix has added another useful deal with a European cable TV provider, marking its third in the market. While there is continued speculation and reports about Netflix tapping Comcast in a similar deal in the United States, it has just added its third deal with a European cable TV provider. Denmark's Waoo service will now provide Netflix functionality to its pay TV customers. It has around 270,000 subscribers. Previously, Netflix struck its first such deal with Virgin Media in the UK and followed it up with a deal with Sweden's Com Hem. Perhaps Netflix is seeking such a deal with a cable provider in all European states. In the United States, Netflix is likely to sign a deal that will bring its app to set-top-box subscribers of a cable TV provider, and reports suggest Comcast is the most likely. While seen as one of the major factors for declining subscriber tallies for cable companies in recent years, Netflix is also seen as a possible solution to stop or slow down subscriber loss, and may also entice cable customers to opt for more expensive, faster Internet packages.